The R. M. Santilli Foundation will sponsor a workshop on Santilli HyperMathematics, including its scientific applications for advanced studies on biological structures, at an upcoming international scientific meeting September 22 to 26, 2013, in Rhodes, Greece. For details on the workshop, please visit http://www.santilli-foundation.org/Hypermath-work.php. 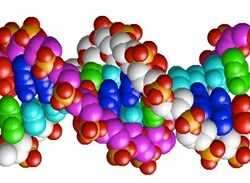 A rendering of part of a DNA to illustrate its complexity and the need of the most advanced known mathematics to attempt the decifring its code. The R. M. Santilli Foundation is hosting a workshop on Santilli HyperMathematics at an international scientific meeting to be held September 22 to 26, 2013, in Rhodes, Greece. The workshop will focus on Santilli's irreversible, multi-valued HyperMathematics, which have applications in the advanced studies of biological structures, such as DNA, according to Dr. R. M. Santilli (see the announcement http://www.santilli-foundation.org/Hypermath-work.php.). In the 190s, Dr. Santilli observed that biological correlations of two or more atoms of a DNA can produce an entire organ with an extremely large number of atoms, as published in the report,R. M. Santilli, "Iso, Geno, and Hyper-Mathematics in Biology," Ukraine Academy of Sciences, 1992). According to Dr. Santilli’s research, these correlations can be mathematically represented with a product, and the irreversibility of the growth of a biological structure can be represented with an ordering of the product. Therefore, Santilli identified the most general known realization of the axioms of a numeric field admitting two non-null different units for the evolution forward and backward in time, each admitting an arbitrary number of ordered values, today known as Santilli ordered multi-valued Hyper Units. Santilli then maintained the axioms of a numeric field with a compatible multiplication in such a way that the product of two hypernumbers yields a large number of ordered results in an attempt to represent the birth of a biological entity from a DNA. The generalization of numbers into hypernumbers has permitted the construction of the irreversible multi-valued hypermathematics, including hyperlifting of functional analysis, differential calculus, algebras, geometries, symmetries, etc. The workshop will advance the study of the coverings of quantum mechanics and chemistry with HyperMathematical structure, known as irreversible multi-valued HyperMechanics and HyperChemistry, in an attempt to resolve the limitations of quantum mechanics and chemistry in biology (see the special issue http://www.santilli-foundation.org/docs/Santilli-37.pdf). This workshop will discuss the limitations of quantum mechanics and chemistry for biological structures and the more accurate descriptions permitted by HyperMechanics and HyperChemistry, according to Dr. Santilli. This session will be held September 26, 2013, at the 11th International Conference of Numerical Analysis and Applied Mathematics, in Rhodes, Greece. The R. M. Santilli Foundation has been organized and funded for the support of fundamental advances in mathematics, physics and chemistry and for the promotion of scientific ethics and accountability. Dr. R. M. Santilli is the recipient of several honors, such as: scientific prizes from France, Italy, Nepal and other countries; the Gran Cross of the Sant'Agata order from the Republic of San Marino; the Mediterranean Prize also granted to Hillary Clinton, Prince Albert of Monaco , former France President Nicolas Sarkozy, Juan Carlos King of Spain, international architect Renzo Piano, and other personalities (see Dr. Santilli's CV at http://www.world-lecture-series.org/santilli-cv).